When prostate cancer metastasizes, spreads outside of the prostate itself, it typically affects the structures in its immediate vicinity. Structures near the prostate likely to be involved include your seminal vesicles, urinary bladder, and bones of your pelvis. Lymph nodes near the prostate are also often affected. Prostate cancer has a tendency to spread to the bones, specifically the pelvis, upper legs, and lower spine. While those are the most common sites for prostate cancer bone metastasis, any bones in your body could be a potential target. Prostate cancer can involve the liver, intestines, brain, lungs, and other tissues as well, though these are far less common than the bones. Prostate cancer metastasis may be suspected if you have specific symptoms such as new lower back pain or elevated liver enzymes. These may be signs your cancer has spread to your spine or your liver, respectively. If your PSA levels continue to rise despite treatment, especially if they are rising particularly fast, this may be a sign that cancer is metastasizing somewhere in your body. If your doctor suspects your cancer might be spreading, they will likely order more imaging tests. A common imaging workup may include a bone scan and a CT scan of the abdomen and pelvis. An MRI might be done as well. Some research centers are also using magnetic MRI's or PET scans to further refine the staging of prostate cancer. Bone scans. Bone scans look at your entire skeleton. Metastasis to the bone will usually show up as "hot spots" on the bone scan. There are a number of factors which can cause "false positives" on bone scans, so it's good to understand this before having a study done. CT scans. A CT scan can be used to look for metastases in the abdomen and pelvis. Prostate cancer that has spread to the liver, intestines, or bones of the abdomen and pelvis can usually be found with a CT scan. Cancer, which has spread to the lymph nodes, can sometimes be detected if the lymph nodes have become enlarged. MRI. 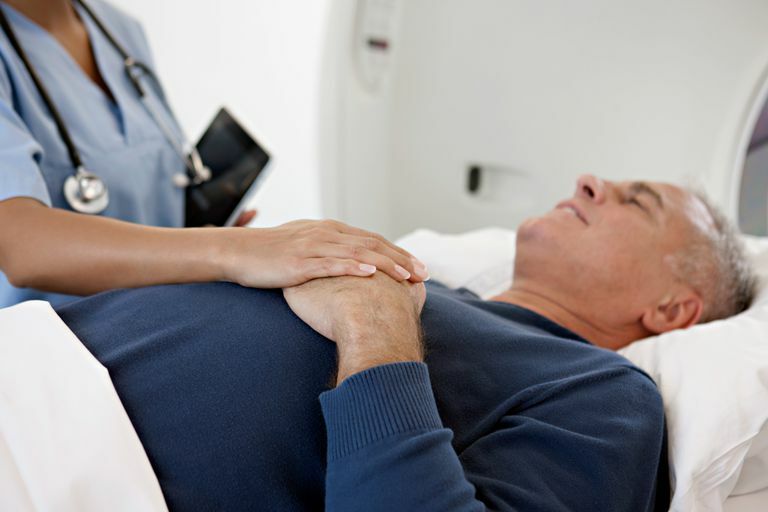 MRIs are sometimes used if there is a question as to whether your cancer has spread into tissues near the prostate or to see if there is tissue left behind in the prostate area following surgery. Enhanced MRI. Using an enhanced MRI to look for prostate cancer metastasis is a new area of research that aims to find difficult to detect lymph nodes metastasis. First, you are injected with tiny magnetic particles a day before the scan, then, the next day, you have an MRI. So far this method is the best way to detect lymph node involvement. PET scan. A PET scan is an imaging test that looks at your body's function as well as its anatomy. PET scans are often combined with CT scan. For this procedure, you are injected with a small amount of radioactive sugar. Cells which are actively growing, like cancer cells, take the sugar and light up during the exam. In some cases and with some cancers, PET scans can assist with staging your cancer in ways other tests can not. American Cancer Society. Preventing and Treating Prostate Cancer Spread to Bones. American Cancer Society. What’s New in Prostate Cancer Research and Treatment? Abraham J, Gulley JL, Allegra CJ. Bethesda Handbook of Clinical Oncology. 2005. Why Do Doctors Order an Alkaline Phosphatase Test?